It's hard to believe that three months have elapsed since our last post regarding our adventures in the world of custom wallpaper. Yet here we are, hanging our heads in shame, typing away wildly to make up for lost time. So what have we been up to? Whereas 2009 has been a rough year for a lot of businesses, including a lot of friends locally, we've been able to slog through these hard times, all the while growing. We've doubled our output capacity and increased our payroll. We're happy to say that most of our employees including ourselves live in our town of Ferndale, MI, so we're doing as much as we can to help out the local economy. But enough about us, let's talk about you and your limitless options for a custom wall mural. An over the top image or wild color palette can dress up a blasé room, but if your space is already fleshed out with attention grabbing art and furnishings, a simpler wall mural can be a wise solution. The image in our inspiration room illustrates this. A busy rug and bold geometric art lend themselves nicely to the coordinating wall mural. The simplistic industrial shapes in the custom wall mural in no way detract from the bold accents. The mural simply reinforces the theme of an understated geometric aesthetic, and the splash of perfect blue sky keeps the color moving around the room. 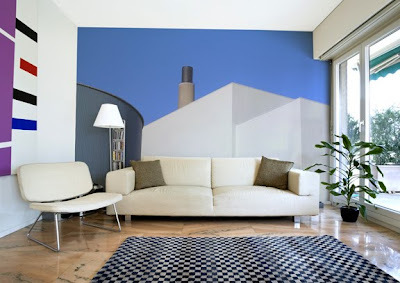 Just another example of how unique and interesting imagery can create a wall mural to accentuate your space. Contact us to begin your project today! Thanks for the nice ideas and tips.It is looking very nice really.And playing with the space is all very nice and interesting.